Imagine what your life would be like if you could implement 17 Habits each and every year! Well let’s talk about a 21 day cycle and get you started on the road to getting more results! Hey there everyone, how is everything in your world right now? I really do hope you are well and taking good care of yourself. 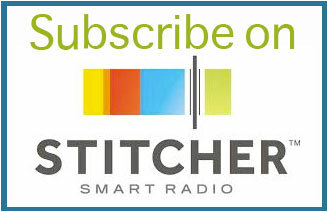 21 Days, 17 Habits, are you curious to know what this podcast is all about? 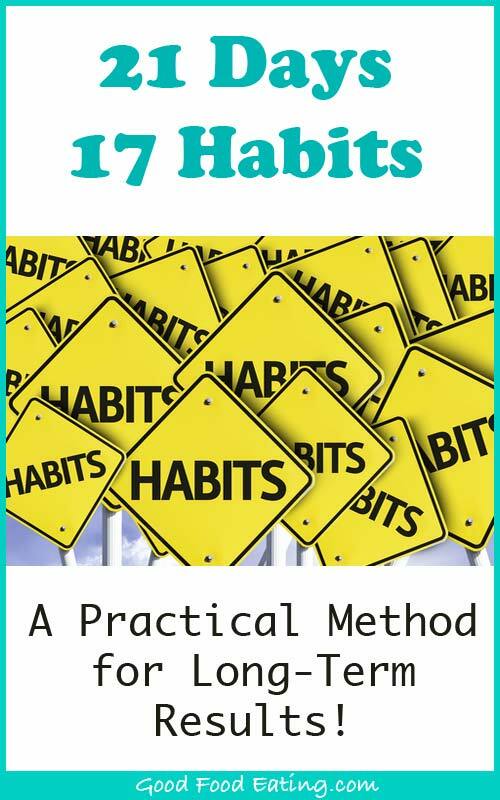 Well I’m not here to share how you can achieve 17 habits in 21 days but if you want to change your habits and change your life, then listen up because it does involve 21 days and allows you to achieve 17 new positive habits and it also happens to be a totally achievable and practical method you can use to transform your life. Sometimes when I’m sitting in my office or on the balcony having a cup of tea, I’ll be thinking about different ways I can help my clients, readers, and subscribers more. And one day I was sitting there thinking about habits, because let’s face it we all have them and it’s our habits we often need to change when we are trying to get healthier, eat better, do exercise, or whatever our goal may be. We’re really good at making wafty goals, but when it comes to putting them into action, we’re not so great at it. Now we have talked about habits here before and if you’re a regular listener you’ll know that I talk about mindset and habits quite a bit. That is because they are critical to our success, to making our goals and aspirations a reality. So I was sitting there one day contemplating this and I came up with an idea to help my clients more, help you more. Over the years I’ve read many books that highlight that it takes us around 21 days to implement a new habit so if we could focus on just one habit for 21 days, then keep doing that, then bring in another habit, in one year we’d have 17 new habits. I told one of my clients Rebecca about this approach in late December, (if you’re listening to this at a later date we’re at the beginning of March now), so I told Rebecca about this method in late December, she had been struggling to get into any type of routine and really wanted to change some of her habits, and this method really resonated with her. So I saw her about a week ago and she said she was making great progress with using the new 21 day method. So far she had implemented 3 new habits, she was getting up a bit earlier in the morning and going for a walk, she was drinking her daily water intake, and she was doing some stretching at night. I was so excited that she had used the method and it was working for her. But she said she wanted a better way to track it over time, so I said I’d create a chart that she could hang up somewhere to keep a log of it over the year. I’ve given her that now and she is going to track it. GFE members also get a copy and we’ve been discussing it inside the GFE forum. It’s so great to see people putting it into practice. So that’s the whole story that inspired me to share this podcast and this method with you. Because if it works for Rebecca, it might just work for you too. So let’s dig in and share how you can use the method. First I want you to reflect on some of the habits you’ve been thinking about changing, some of the habits you’ve been trying to change, where you’re at right now, and how tired you are of going around in circles. I know it’s easy to want to make the changes but 1 month passes, 1 year passes, and still no changes. We’re already in the 3rd month of 2015 now, so think about how you’re doing with your goals so far this year. Is it really good? Or is it not as you expected? Do you roll your eyes at the end of the day and think, well that was a dismal failure, AGAIN! Next I want you to future pace a little. If you could obtain 17 simple new habits in one year, imagine how different your life would look. Well if we start now at the beginning of March you can obtain 14 new habits this year by following this method. So imagine how different your life might be like with 14 new positive habits in place this year. Imagine what a difference that would make by comparing the last year or last years of no action, to a year where you put 14 new things in place. Imagine how energetic, how confident, how empowered you will feel. And imagine how many other people you will inspired along the way, including friends, family, and colleagues. How great is that going to feel? It is going to feel awesome! So now that you’ve had a reality check on where you are now and we’ve future paced to realize how awesome your life will be with all of these new habits. Let’s dig in to the simple steps you need to take to bring more awesomeness into your life. Changing our lives is a process made up of many different goals and habits so the first place we need to start is by chunking it down. One of the reasons many people fail is because they take on way too much too fast. This method uses smaller, simpler steps because this method is all about long-term habit change, long-term success. So here’s what to do first. Take a piece of paper and list down all the things that you would like to change, this can do with your health but it could also be things do with your finances, your relationship or whatever you like. We’re going to use the example of health and nutrition goals here because that’s what this podcast is all about. But just know that you can take these principles and apply them to any aspect of your life. So on your piece of paper you’ll have a list of all the things you want to change. Here are some examples of what your list might contain. It will also include bad habits that you are well aware of. The idea is to write down as many things as you can on the list, things you don’t like, want to change, feel negative about, but also be aware that you can add and subtract things off the list as much as you like. So this is a working list, so to speak, because it’s going to be a list you can draw from as each 21-day period clocks over. Once you have your list the idea is to pick something easy. When you look at the list what is the easiest thing that you could do first. The idea here is that as we begin to implement things and stick to them, we also begin to build confidence in ourselves, we build confidence in our ability to succeed instead of fail, we build confidence in knowing we can do it. Pick the easiest thing, work out how and what you are going to do and then just do that for the next 21 days. You don’t have to do everything, change every habit, take on everything at once, all you have to do is do one thing. So let’s take a couple of things from the list we just shared earlier, things that I might think would be easy to implement. The 3 things from that list would probably be the exact same things my client chose first, exercise, drinking more water, and stretching. So when can you fit in just 10 minutes of exercise to begin with? I know my client Rebecca chose first thing in the morning, so when might that be for you. Then get up tomorrow and follow your plan, do your 10 minutes of exercise and just go about your usual business. You’ll do that for 21 days and by the 7th day you’ll probably find you might be exercising for 15 minutes and by the 21st day you might have built yourself up to 20 minutes because you’ve found you enjoy it. But even if you’re still doing just 10 minutes, you’ve made it through to 21 days and continued to do your new habit every day. Next you choose your 2nd goal. You decide you need to drink more water. So you fill up 2 bottles first thing in the morning because that’s the amount you want to get through every day. So you keep doing your exercise and actually you take one of your water bottles with you and almost drink the whole thing while you’re out walking. And over the day you get through the rest. Now you do that for 21 days, so now you’re doing your exercise and drinking more water every day. You’re starting to feel a bit better and have more confidence that you can stick to your goals. 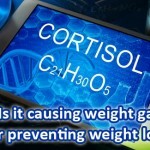 After 21 days you decide it’s time to stop your chocolate munching habit after dinner. So you sit down and work out what you will do instead. You decide that you will replace it with eating an apple instead. So after dinner the next day instead of having chocolate you have an apple. Now you are doing some exercise, drinking more water and eating an apple after dinner instead of chocolate. Cool, you’re making great progress. After 21 days you decide that you could still watch TV but instead of just sitting on the couch you could get down on the floor and do some stretching while you watch TV. Now you’re doing some exercise, drinking more water, eating an apple after dinner, and stretching to ease your sore back. Yes, you’re up to 4 new habits and although these habits might seem small, you’re starting to feel a real difference. So you keep doing those things and start habit number 5. I think you get the picture of how this 21-Day Method works right. Can you see how you will get to the end of the year and make noticeable changes in your life? Can you also see how simple and achievable it is when we chunk it down like this? 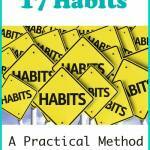 You can do this method to achieve 17 new habits each year. Can you imagine what your life might look like in a few years if you start using this method? I’m sure you will agree it will look a lot different. This is a totally achievable and practical method you can use to bring about change. Sure, you still have to make the commitment to try this method by following these steps but if you dare to take on the challenge I bet it will work for you. Give it a go, you’ve got nothing to lose by trying it. 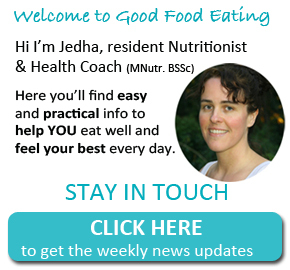 You can give this method a try starting today, starting any time of the year, and begin implementing new habits to transform your health and transform your life. And one amazing thing you could do for a friend, family member, or colleague, is share this podcast with them because it might be the thing that transforms their life too. Imagine how grateful they would be if you help them find a way to achieve 17 new positive habits! Thanks for joining me today and I look forward to hearing about your habit change success!